As usual zombies were thick on the ground in London in October, although the group who were putting in an early pre-Halloween appearance for charity on October 13 were a very much more organised group than most, on a charity pub crawl raising funds for St Mungo’s, a charity that really does help the homeless to help themselves. Despite the name it isn’t a religious organisation, but took its name from the patron saint of Glasgow, the home town of its founder, although it began with a house open for rough sleepers in Battersea, and it seems a very good cause which people can get involved with in different ways – giving money, fund-raising event such as this and volunteering to help in some of the over a hundred projects it runs. So perhaps this event attracted a better class of zombie, as the undead aren’t generally noted for their charity, which perhaps just doesn’t usually go with eating flesh and brains, although most zombies I’ve actually photographed in past years have seemed to have a greater interest in drinking alcohol. And I was photographing them at the start of a day-long pub crawl around London, a fun event with a serious purpose. 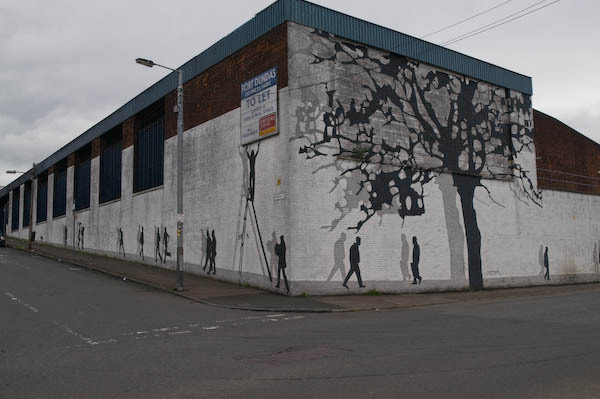 There may well be a special connection between zombies and Glasgow, certainly my first experience arriving in the city centre there around closing time in the early 1960s was interesting, as was a week staying on Sauchiehall Street in the European City of Culture in 1990. Seriously it is a city I liked and we went back to stay there for a few days in 2008. Were these zombies on a Glasgow street in 2008? 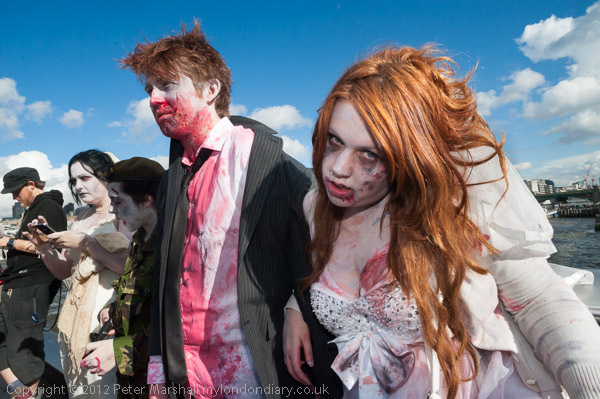 But probably the start of their day, around lunchtime, wasn’t the best time to photograph them, and things would have got a little livelier (perhaps not the right word with zombies in mind) after a couple of pub visits. Zombies are after all really creatures of the night, and despite the horror costumes (or because of them) some were still just a little shy. The bright low winter sun gave me a few problems, and at one point I found myself needing fill flash but having the SB700 on the wrong camera, and no time to swtich it over in the fast-changing situation I made the wrong decision to keep on working without flash, forgetting completely the built-in flash on the Nikon D700, which would have helped at the flick of a finger. Stupid. I’ve just got out of the habit of using it, as the accessory flash units usually do a better job. Of course it was possible to more or less rescue the images in post-processing thanks to Lightroom, but certainly some of the better pictures I took would have been improved with some fill flash. By the time I’d paused long enough to change the flash around the situation had disappeared. The other reason it was probably a bad time was quite simply the huge number of other people around taking pictures. Perhaps later in the day they would have thinned out a little. This was an event that seemed to attract a real crowd of photographers, perhaps the kind of event that gets listed in amateur magazines as a photo-opportunity. I had other things to photograph, and so wasn’t able to spend more time with them. 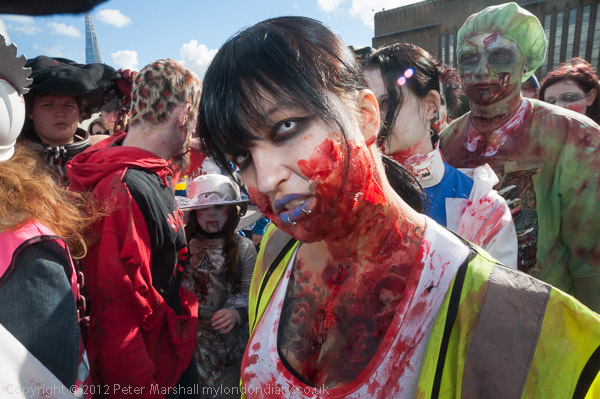 I knew too that I would be photographing zombies again in a couple of weeks time. 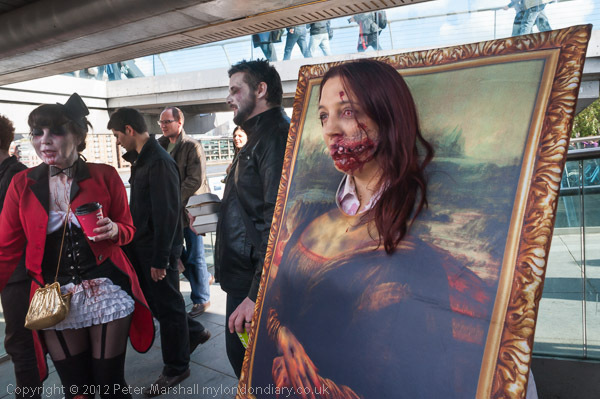 More pictures on My London Diary: Zombies Invade London. This entry was posted on Friday, November 9th, 2012 at 10:46 am and is filed under My Own Work, Photo Issues. You can follow any responses to this entry through the RSS 2.0 feed. You can leave a response, or trackback from your own site.